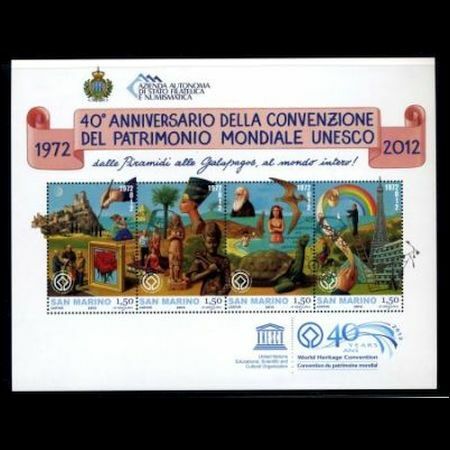 San Marino 2012 "40th Anniversary of Unesco heritage"
The UNESCO General Conference approved on the 16th November 1972 in Paris an agreement on the protection of the world, cultural and natural Heritage. 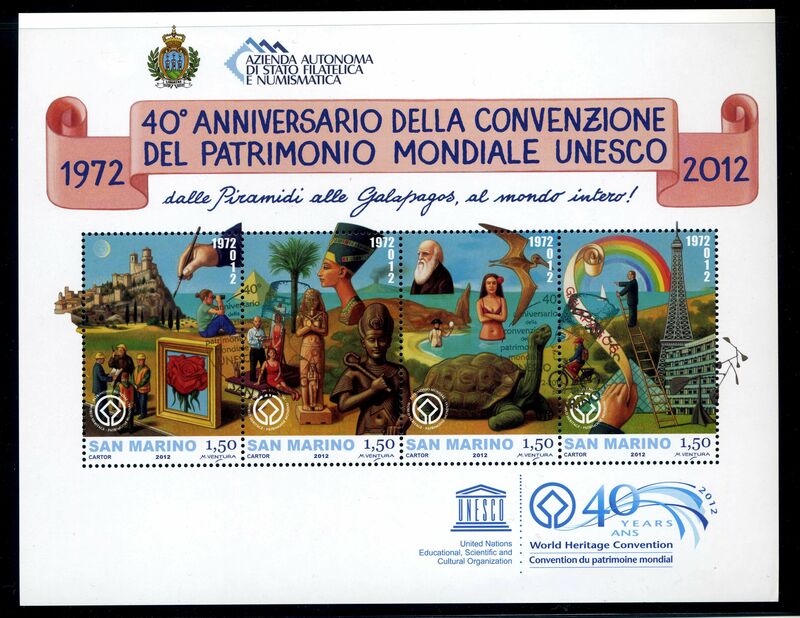 The idea to create an international movement to protect cultural areas and nature was born in the second post-war period. The Agreement forces the Member States to regularly supply a report on the state of preservation of the registered areas. It encourages the public awareness about the world protected areas and improves the preservation by educational and informative programmes . "To preserve our heritage for the future generations" it is a must that the Agreement and the Member States fixed as a goal and warning. 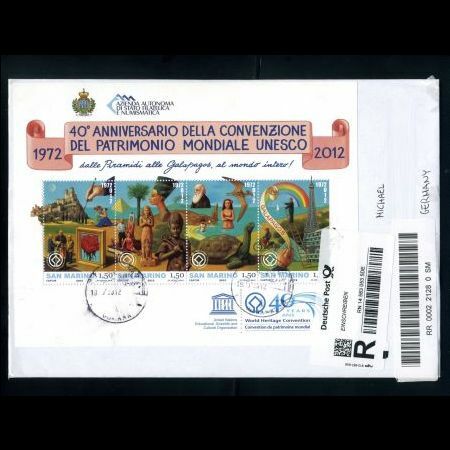 Today, after forty years from the signature of the agreement, the world heritage is well understood, so much that registered areas receive international cooperation, mutual help and management models. 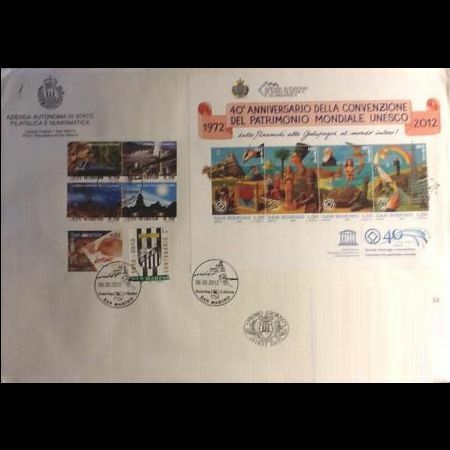 With the souvenir-sheet designed by M. Ventura, "From Pyramids to Galapagos, to the whole world" the Azienda Autonoma di Stato Filatelica e Numismatica of the ancient Republic of San Marino makes the first issue after the agreement signed on the 3rd November 2011 in the UNESCO official seat where the "Progetto San Marino-Unesco" was accepted; a long-term cooperation to increase the value of Humanity Heritage through the philately of San Marino. 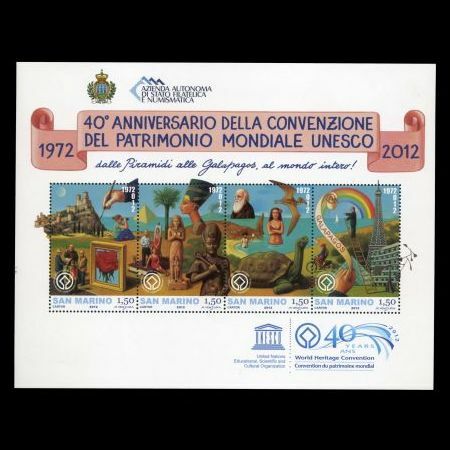 The first stamp of the serie shows, among other goods, the "Historic centre and Mount Titano" in foreground as part of the world humanity area heritage. 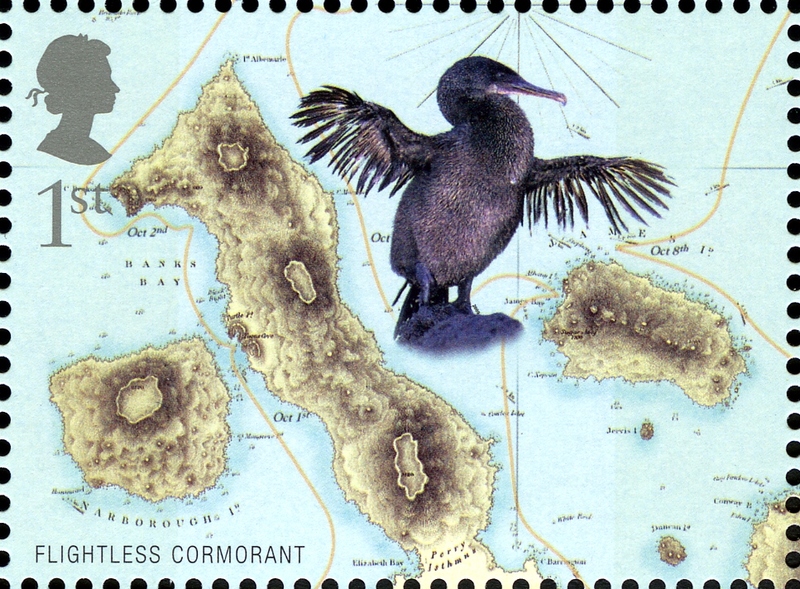 Two stamps on the right side of the block are related to Galapagos Islands. The Galapagos Islands (official name: Archipilago de Colon; other Spanish names: Islas de Colon or Islas Galapagos) are an archipelago of volcanic islands distributed around the equator in the Pacific Ocean, 972 km (525 nmi) west of continental Ecuador, of which they are a part. The voyage of the Beagle brought the survey ship HMS Beagle, under captain Robert FitzRoy, to the Galapagos on 15 September 1835 to survey approaches to harbours. The captain and others on board, including his companion, the young naturalist Charles Darwin, made observations on the geology and biology on Chatham, Charles, Albemarle and James islands before they left on 20 October to continue on their round-the-world expedition. Primarily a geologist at the time, Darwin was impressed by the quantity of volcanic craters they saw, later referring to the archipelago as "that land of craters." His study of several volcanic formations over the 5 weeks he stayed in the islands, led to several important geological discoveries, including the first, correct explanation for how volcanic tuff is formed. 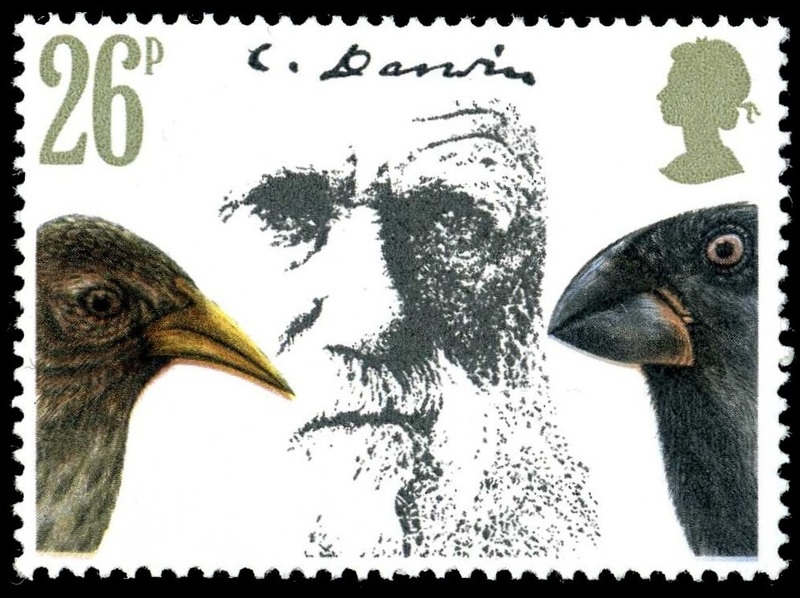 Darwin noticed the mockingbirds differed between islands, though he thought the birds now known as Darwin's finches were unrelated to each other, and did not bother labelling them by island. The Englishman Nicolas Lawson, acting Governor of Galapagos for the Republic of the Equator, met them on Charles Island, and as they walked to the prison colony, told Darwin the tortoises differed from island to island. Towards the end of the voyage, Darwin speculated that the distribution of the mockingbirds and the tortoises might "undermine the stability of Species". When specimens of birds were analysed on his return to England, it was found that many apparently different kinds of birds were species of finches, which were unique to islands. These facts were crucial in Darwin's development of his theory of natural selection explaining evolution, which was presented in The Origin of Species (full name "On the Origin of Species by Means of Natural Selection"). The fact that evolution occurs became accepted by the scientific community and much of the general public in his lifetime, while his theory of natural selection came to be widely seen as the primary explanation of the process of evolution in the 1930s, and now forms the basis of modern evolutionary theory. In modified form, Darwin's scientific discovery is the unifying theory of the life sciences, providing logical explanation for the diversity of life.Darwin's work had far-reaching impacts on the development of Paleontology, Antropology and many other Biology and Psyology related scients. This work changed our view on origin of life and provided and explanation about fossils found everywhere ariund the world. Nowadays we are not belive in dragons and seamaid and not associate a huge bones to some titans or any other kind of mythological creatures. Every modern child knows who is Dinosaurs and Pterosaurs. On the second stamp from right is Charles Darwin on the background and pterosaur (probably Eudimorphodon ranzil).